A new venture for me, a turtle (or polo) neck tee. 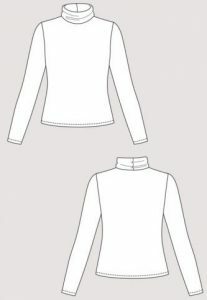 Inspired by Amanda from ISEWALOT and Rosie from SEWN I downloaded the pdf pattern for the Paola from Named Clothing which from the address looks to be based in Finland. Dressmaking is truly an international hobby! Firstly, I have to admit to being rather ”gungho!” as I have printed and used a fair few pdf patterns of late and when the Paola was printed I was initially stumped as it does not print in exactly the same way as those from SEWOVERIT and TILLYANDTHEBUTTONS. It did not help that half way through the printing process I did not notice the paper tray was empty and therefore I had only 12 sheets printed instead of the required 20! So back to the laptop and printer to get the remainder of the pattern. I checked out reviews from others including SewingPatternReview.com which is my go to website for checking out what others think of a particular pattern. Unfortunately there were no reviews on the site for the Paola, possibly it is too new a pattern to have reviews posted just yet. So just down to me to check the pattern measurements and decide which size to cut. I chose a 20 across the shoulders and upper chest then graded up for the bust, waist and hips. The sleeves were shortened by 1 inch. For the first tee I used “By the Pond” (£3.99/m) listed as t-shirting fabric on the Fabricland website. The choice of this was a straight ‘lift’ from Rosie’s vlog where she discusses the best types of jersey fabric. The fabric is quite fine, definitely t-shirt weight. 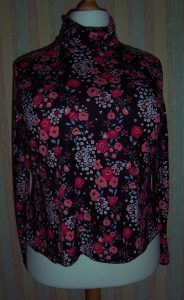 I used some clear elastic(as per the instructions) to stabilise the shoulder seam and after that it was pedal to the metal on the overlocker and within 1 hour the top was completed. 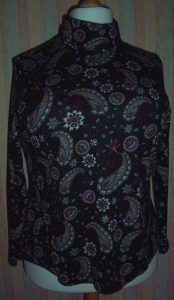 I used my standard jersey twin needle for the hems on the sleeves and body. I am delighted with the top, the pattern, the fabric and the fit. So I went straight on and made another! 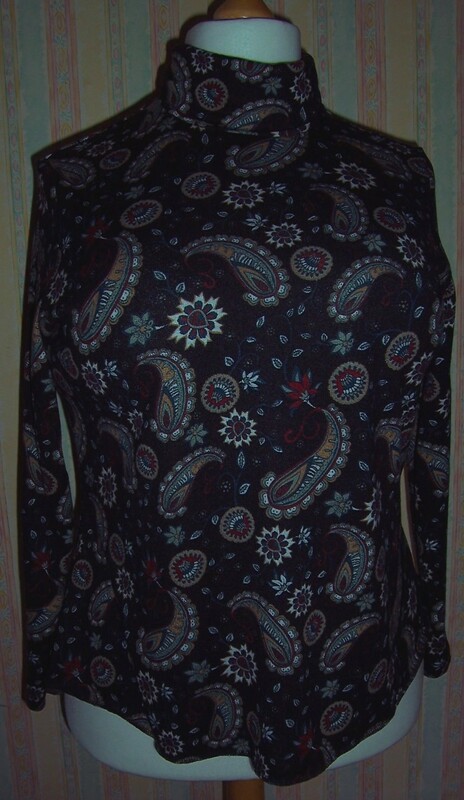 The second Paola is made from a winter-weight jersey “Paisley Hollow” again from Fabricland (£4.59/m). The only adjustment made to the pattern was to extend the body front and back pieces by 2 inches. Another hour and another completed top. Yay!! They look prettier in real life, but well done all the same. Thank you Pat, you will see from the Leopard print that I am still ‘finessing’ this pattern!